A set of 2 Easter designs - an Easter egg with a bunny cutwork embroidery and a bunny border classic machine embroidery. You receive 3 machine embroidery files which also include a mirrored version of the bunny border embroidery. 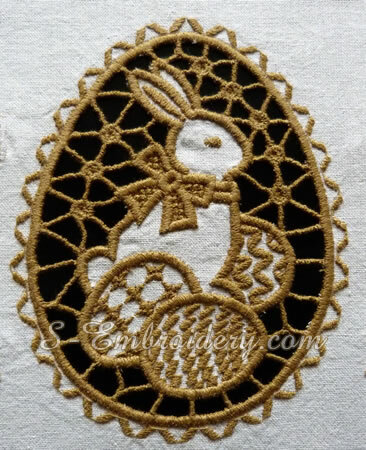 The size of the Easter egg cutwork lace is 3.66 x 4.75 inches (93 x 120 mm) and the bunny borders measure 2.88 x 4.88 inches (73 x 124 mm). The number of stitches is, respectively 18,673 for the cutwork and approximately 12,300 for each of the borders. You can use the Easter designs from the set in combination or separately.